The first thing to mention about conducting building surveys in the Philippines is that it is hot and sunny and sunscreen is recommended. For those engineers that are used to driving a desk all day, full days outdoors in the sun have been a bit of a test. I was a bit light on the sunscreen in a few places, and felt it pretty quickly. Overall the team is handling the weather pretty well, but it is warm and hydration is an issue. Bottled water has been a key provision for the team. The engineers are engaged in the technical aspects of the project. 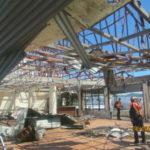 The failures have run the gamut from lost roofing metal to complete collapse of reinforced concrete structures. It is interesting to watch a group of engineers like this address failures. When they work together, many good ideas and theories arise. Engineers of different backgrounds are reviewing failures and reviewing evidence that may or may not support a given premise. The benefit of a diverse group like this one is that many perspectives are brought into play. The general purpose of the team is to make brief assessments for the purpose of allowing ideas for improvement to be developed. Certainly, detailed and thorough evaluations of failures cannot be completed in such a short time and with limited resources. However, general ideas for improvements can be formulated from the basic observations noted. Some of the challenge will be to identify remedies and/or improvements that will be economically feasible within the context of the Philippines construction market. Due to the shortage of hotels in the area, we had to change to other accommodations today. 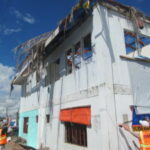 The hotel to which we moved was itself badly damaged in the storm and was not completely rebuilt. Badly damaged roofing and structural elements existed at various portions of the property. The team included this facility in its evaluation and found a number of interesting findings. One of the things we have seen is how businesses have returned to operation, despite the financial limitations of rebuilding. Portions of the business that can open are re-opened, and those that need to remain closed stay that way next to the open part. Again, the support staff for the team is great. The interpreters, drivers, and security guards make our jobs much easier. One of the duties our interpreter has taken a fondness to was holding up a building identification board so the assessors could photograph it, to keep the photos clear. In the process, Valerie the interpreter began to model the sign with some artistic flair. We assured her that one day Vanna White would retire and a job may open up for her. Unfortunately for Pat Sajak, she has her eyes set on practicing law in the Philippines. David, our security guard, today decided not to bring his automatic rifle and dozen clips of ammo. He was armed only with a 45-caliber sidearm. Even with the reduction in firepower, we felt plenty safe with him on patrol. Construction practices are different in many ways than in the U.S. It appears that many structures are built without the use of cranes of any type and for those where a crane is used, it seems minimal. Concrete road re-paving is performed in short increments of about 100 yards, with intermediate sections open to traffic, rather than longer stretches of closed roadway. Most of the concrete blocks made are handmade, with only air curing. Most construction workers wear sandals, for almost any trade. The only construction work boots I have seen have been on the ASCE team members. I have not seen any worker tie-off for activities on a roof, scaffold, or ladder. 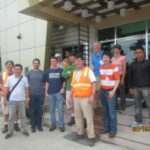 It is quite a different safety environment than the U.S.
Saturday, May 3, a team of seven civil engineers from ASCE’s Technical Council on Forensic Engineering, in cooperation with the Technical Council on Wind Engineering, left for the Philippines on a week-long mission to conduct post-disaster assessments, documenting evidence of structural and geo-system damage to historic and residential structures and public infrastructure. Mark E. Leeman, P.E., M.ASCE, vice president of Facility Engineering Associates of Fairfax, Virginia, chronicles the team’s experiences in this exclusive daily report for ASCE. This is the fifth installment in the series. 1. Will you be drafting a final report? 2. Will you be making any recommendations for adaption of any model building codes to address reduction of risk and damage to police stations, government buildings, highways, public market places and bus stations?